Home Celebrity Celebrity Moments Celebrity Photos Kahit Konting Pagtingin PIctures with the Stars Rockcoustic Heartthrob Sam Milby Sam Milby and Rocky Batara Sam Milby Plus Rocky Batara Equals "Rock-coustic Heartthrobs!" Sam Milby Plus Rocky Batara Equals "Rock-coustic Heartthrobs!" 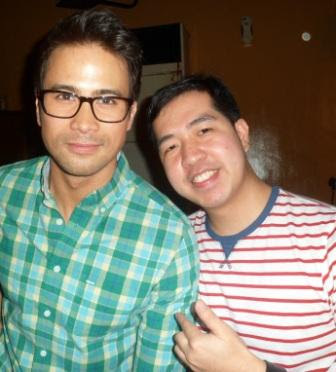 For the third time around, I met the the so called "Rock-coustic Heartthrob" Sam Milby. Well, putting us together gave him the said title - Sam Milby plus Rocky Batara definitely spells "Rock-coustic Heartthrobs!" Our second meetup with Sam was during the red carpet premiere night of "24/7 in Love" in November 2012. On that time, we talked longer and got our first video. And last week, January 16, 2013, our third meeting took place. This was during the grand presscon of his newest teleserye "Kahit Konting Pagtingin." The grand presscon was a videoke-comedy bar inspired which took place in Laffline Comedy Bar, Timog, QC. He performed singing his very own rendition of The Calling's "Wherever You Were Go." Aside from having our photos again together, we got our second video. Yes, I interviewed Sam sharing his character in the teleserye.